So this morning I have put gaffer tape over the sensible lips that chastise me for self indulgence and sat down to pound the key board for a while, just for the shear enjoyment of putting words on virtual paper, and this is the result. It is short and not very sweet, but I hope you enjoy it. 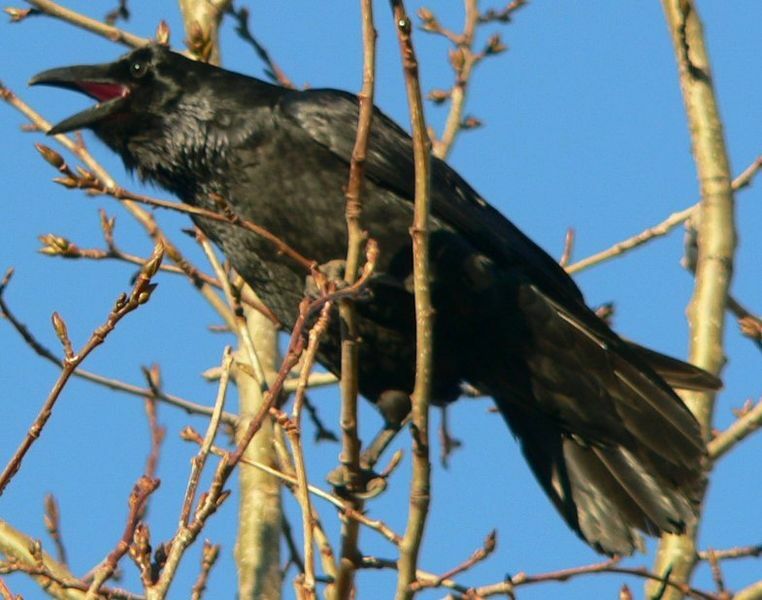 “Raaackkk, raaaaack, raaack” the crow raked the air with his call, issuing a challenge to the wind, who duly responded by tearing at his foot hold and feathers. “noooo….” came another moan from far below. The crow eyed the distant figure through the gnarly branches and called again. The wind re-doubled it’s efforts to dislodge the bird from the high branch. All the branches bent and whipped like so many bowstrings being stretched and released in the heat of battle, but no arrow hit their mark. The body made a rhythmic thud against the trunk of the tree as it swayed in the wind, the beat was accompanied by the syncopated sounds of breath being beaten out, then pulled sharply in. The sound was hypnotic, the heartbeat joined the assemble as did the sound of blood pulsating through a swollen head, the wind, the tree and the grasses all added their accents to the grandeur of the symphony. He exulted in the death throws. The crow intrigued flew down from his lofty perch. He landed on the pendulum, flapping slightly as the body bumped and swung. Still he found good purchase on the chin and cocking his head on one side, looked down into the red and ragged hole that had once contained an eye. He then looked into the remaining whole eye, there was still a little life in there yet even though it stared blankly at him. So he pecked at the blooded hole finding a loose morsel of flesh. The crow was startled and indignant as life returned to the promising meal, he raised iridescent wings to leave the body, but was caught by a swift hand clutching at his feet. He flapped and twisted, pecking at that one good eye which now stared back into his own black bead with full and conscious vision. I enjoy your imagery and prose. The crow and raven being of great spiritual power for me, I find this short tale very believable. Nice work! I have a small murder that comes to our property to be fed. I started feeding them and the Turkey Vultures three years ago. Now when I come outside can call,” Crow!”, they come. The vultures fly overhead looking down on me, silently, waiting for me to respond with food. Fabulous imagery and a very powerful piece of writing …. I also wonder what the body will do next ….. Writing like that isn’t an indulgence, it’s a gift to the rest of us. Keep writing. Great and very evocative piece of writing. As both writer and artist one’s eyes need to be open to both dark and light images, The Crow certainly did that. Good stuff! I agree with Helen Wood’s comments. Creativity is not an indulgence. More! At the risk of sounding pretentious, this story resonates in that shadowy aspect of us that stirs only to the deepest myths. You have invoked the tattered banners of red, black and white – blood,wing and flesh – which, as you probably know, occur in folktales over and over again and are old beyond knowing. Wonderful stuff ! No art is ever an indulgence but a necessity to becoming whole! Do you by any chance share your life with a Corvid? You have captured the attitude perfectly, the curiosity, the confidence and the very essence of Crow! Thank you everyone for your lovely comments, I am really happy that the piece has been enjoyable for the readers. I have “worked” with Corvids since the beginning of my Druidic journey, they have accompanied me at every stage from my first initiation in a cold Samhain field, through to the present day. I love the whole family of Corvids and find their wit, intelligence, out and out cheek and obvious joy at life, an inspiration everyday. I hope they feel I have done them justice, as there is a story abroad in the world, that if a murder of crows is gathered, they will take turns in telling each other stories. But woe betide the Crow who does not tell a good story as they run the risk of being torn asunder by the disgruntled crowd. That’s so evocative Cerri – please keep writing – you are a natural – it just flows! !